The commune of Cite Soleil is a densely populated area within Port-au-Prince that is rife with crime. The United Nations has even labeled this region as a Red Zone, and UN staff is warned of the high security risk of traveling through Cite Soleil. Though this area is one of the largest shanty town settlements in the Northern Hemisphere, it still took over two weeks for aid to reach these residents after the 2010 earthquake. Therefore, Project Phoenix has set its sights on helping a community to not only create bold and innovative solutions for sporting infrastructure, but also investing in the education, training, and mentoring of this city. Project Phoenix was created by Morad Fareed of real estate developers Delos and Boby Duval of the youth charity L’Athletique D’Haiti. Their partnership was formed at the 2012 Clinton Global Initiative and they quickly set out to create this fantastic new soccer stadium in Cite Soleil. Their driving force remains their love for teaching youth the discipline of team sports. They actually both were high level competitive athletes at one time. Project Phoenix will be a shining example of how architecture can change lives. 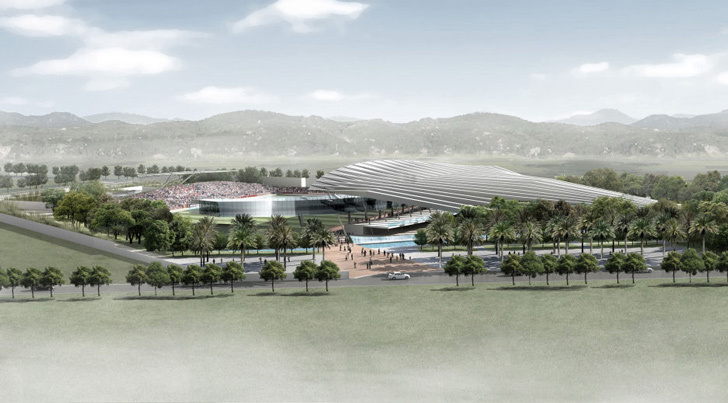 The stadium complex will include a sports academy, an elementary and middle school, dormitories, an edible garden, a lake filled with fish, and a compost and recycling plant. Project Phoenix is devoted to tangible results for the people of Haiti and this stadium will be an amazing thing for the Haitian people.